Home › Style › Which Floor Tiles Are Best For Living Rooms? What are the best tiles for your living room floor? It all depends on the look you’re after. Here are 8 of the most contemporary living room looks, and the floor tiles that designers employ to deliver them. 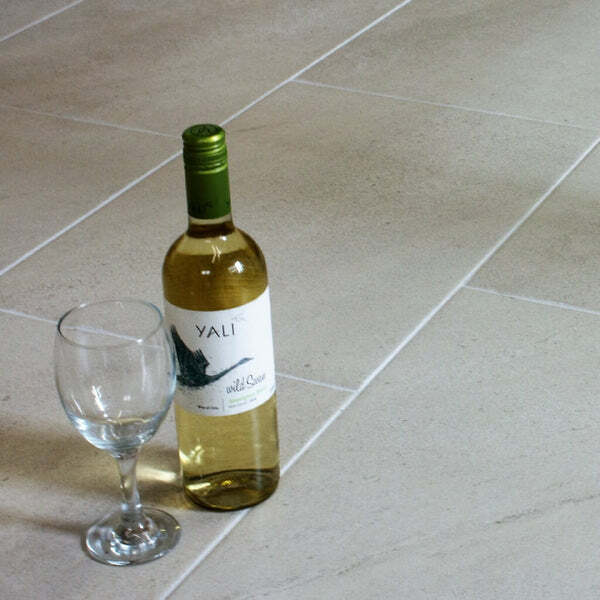 These tiles deliver a brilliant natural effect by mixing the different patterns found in sandstone at various angles. And the use of different sized tiles, as in the image below, conveys a sense of majesty to the living room. 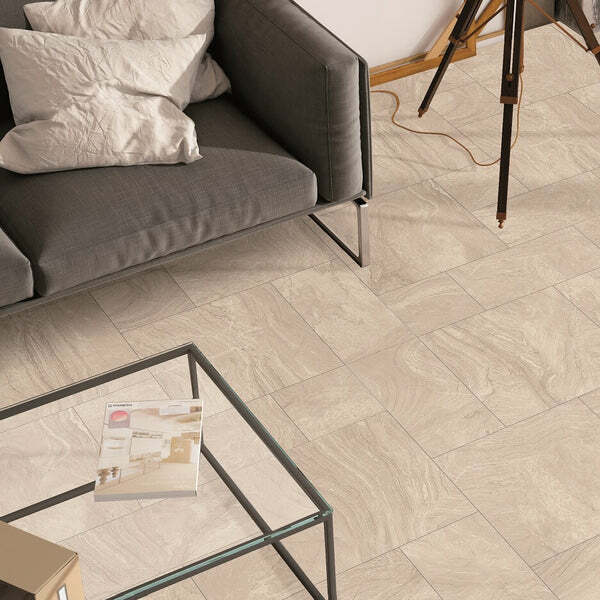 The highly polished glaze of these tiles, offset against the subtle veining, really conveys the rich taste of natural stone and brings a certain Tuscan flavour to living rooms. 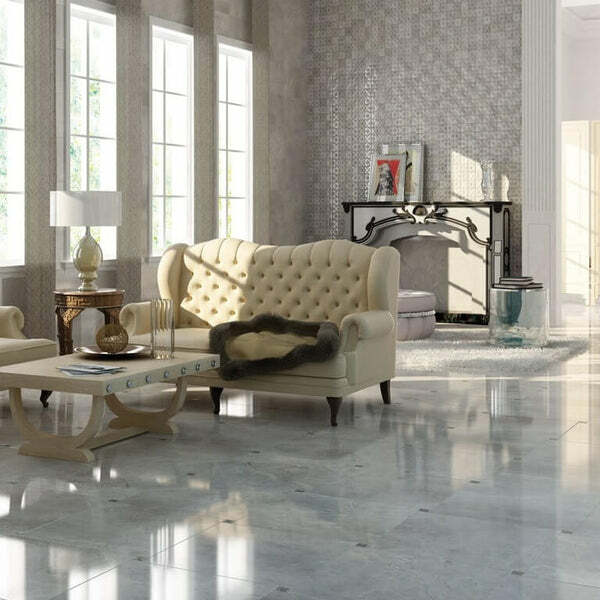 Limestone effect tiles, with their warm pearly tones and delicate veining, imbue a living room not just with natural character, but also with a hint of romance. The gorgeous glaze in a gloss version will scatter light in all directions, exploiting each and every ray of sunshine available in the dark midwinter. The wood effect tile is another style that brilliantly emulates the real thing and looks spectacular in living rooms. They retain the warmth and cosiness of natural wood flooring but none of the costs and hassles associated with maintenance. A wide spectrum of ceramic and porcelain wood effects are available - in a range of styles, colours, and sizes - and oak is the most popular when it comes to living rooms. Cutting edge inkjet technology creates effects, such as recessed ridges and raised knots, that beautifully encapsulate the look and touch of genuine oak woodgrain. It’s this exact replication of solid English oak both in feel and appearance, and the warmth, cosiness, and charm it exudes that makes oak effect tiles best for living rooms. Towards the end of last year, and continuing into this year is a move towards the rustic look of distressed wood. Modern technology can now produce ceramic and porcelain tiles that perfectly resemble planks of salvaged, reclaimed and repainted timbers – even recreating details such as old nail holes in the corners. These tiles radiate a certain character and charm that many British homeowners are attracted to – as if the ‘centuries old’ floor of their living room has stories to tell. By laying the floor in a herringbone pattern, as below, the rustic look is further enhanced. The price of modern urban living is tight spaces in houses and apartments. And consequently white floor tiles are gaining more and more traction in living rooms – the rooms we want to feel most spacious and “roomy”. White tiles give the impression of a larger and more spacious room, and if the surface is pattern-free this illusion is augmented even further. An additional technique utilised more and more by homeowners to improve the sense of expanse in their living rooms is to install large sized tiles, as fewer grout lines are visible. The living room is the space we spend most of our time in, and this is the space in which homeowners most want to make a personal statement. 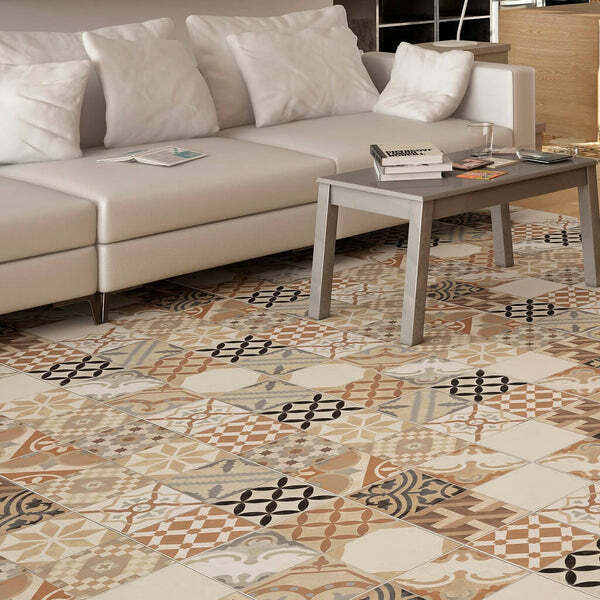 More adventurous homeowners are attracted towards installing encaustic tiles - tiles that are loaded with character, vibrancy, diversity, and an unlimited range of pigment composition, design, textures, tones, and colours. Their versatility means that a range of desired atmospheres are conceivable – from fun to sophistication, rustic to urban – for proprietors to deliver bold yet harmonious statements within homes. It's one of the best looks for modern living rooms. As an antidote to urban living, many homeowners are gravitating towards the pastoral or country-farmhouse look in their living rooms. One of the best ways to achieve this is with a multi-colour palette of slate effect tiles. These tiles, which are increasingly popular in British living spaces, authentically evoke the rural ruggedness and charm of real riven slate, even providing that comforting grain underfoot. And just like the real thing, they boast a superb variation of textures and colours. Indeed the blends of blues, greys, greens and rusts within the same tile model - as in the image below - gorgeously convey that farmhouse feel. The pastoral look entices the homeowner into an idyllic space every time they enter their living room. Urban living spaces across the UK are increasingly succumbing to the allure of clean, simple minimalist finishes. And polished concrete is the standout performer right now. This minimalist look simultaneously portrays a modern edge and a homely natural warmth, uncompromising strength, but with delicate subdued tones. As a result, modern homeowners are increasingly interested in cement effect tiles. Their attraction stems from the unassuming manner in which they integrate seamlessly into living rooms, while never dominating the scene. Rather, their monochrome hues and understated textures tend to provide a stable, neutral canvas which offers the scope and freedom to the creative home dweller to personalise their space. These tiles are the perfect paradox of archaic yet modern, cool yet warm. By combining a variety of tiles and styles on your living room floor, you can create your own feature area with a dramatic bespoke look. Designers are particularly partial to mixing dynamic, vibrant encaustic tiles with monochromes or wood effects to create such a look. But be careful! Encaustic motifs can tend to dominate a room. Thus it's necessary to put some thought into their application to get the best look. A confident and creative installation of encaustic tiles within a more sober, monochrome background will draw the focus to significant spaces within the living room, rather than overpower them. It gives the impression of having a “tile rug” in the very centre of the room.